WhatsApp Group Chat – How to safe guard current & future business prospects as Consultants? The emergence of Artificial Intelligence (AI) and the focus on automation of mundane tasks has got Talent Acquisitionist worried about their future. The current scenario has made Recruitment Consultants want to safeguard their current and future business prospects and they are entitled to do so. Since a major part of the work involves interacting with people it is a given that your interpersonal skills need to be good. Think from the client’s perspective when interacting with potential candidates and vice versa to know exactly what their expectations are. When interacting with the candidate you need to set the right expectations of the role and company which is crucial. Pay attention to the type of hiring you are doing i.e. product or services as the criteria for selection can differ. Know that if a vacancy is a Manufacturing one then these companies don’t like to recruit from service industries especially Software / BPO back ground. Compare your candidates with them and build a talent pool. By focussing on all of the above aspects it will ensure you capture the right culture fit for the organisation. Mapping the sector which a consultant is catering to, will help gain an edge over their competitors. Verticals and Industry or domain are variable factors it’s the interpersonal skill level of the Recruiters which helps them grow. Know that there are two types of customers your dealing with one is external customers and the other is internal customers (stake holders). Most companies focus shifts away from external consultants due to the lack in response and the quality of CVs received. Understanding the Requirement and the candidate is more important than focusing on skills / industry. Have discussions with the hiring manager / BU hiring manager to get the right focus and direction which is important to tap the right talents. Interviewing and assessing the candidates on the basis of the requests shared helps in generating a good ratio. The new projects that are bought in by an organisation can be Clients wherein we need to help them improve their numbers. And one of our representatives will get back to you at soon as possible. We’ve spoken a lot about the Modern Recruiting Techniques that are practiced but have you explored it on a deeper level to understand the possible challenges or the pros and cons? If not then here’s your chance. We @SourcingAdda constantly strive to keep you updated with the current techniques and practices implemented in the Recruitment sphere. In doing so we look at things on a deeper level to get a better understanding of the topics that are discussed. Thanks to one of our Bangalore group member Jackson we are able to establish that. 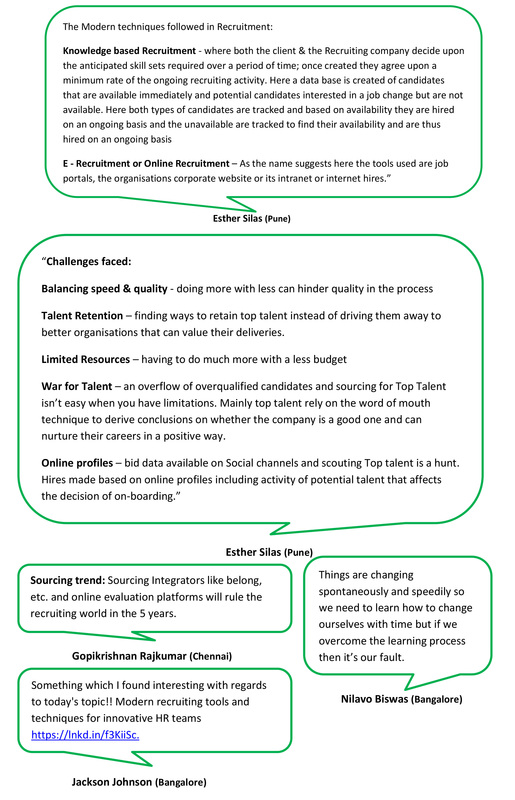 Upon his suggestion to have a discussion on, “Modern Recruiting Techniques and the Challenges in them or the pros and cons” we gained interesting insights. We’re sure you’ll want to gain these insights so we’ll be disclosing the discussion soon and right after we’ll be highlighting the key take away pointers as well. The unavailable ones are tracked to find their availability and are thus hired on an ongoing basis. Sourcing Integrators like belong, etc. and online evaluation platforms will rule the recruiting world in 5 years. And if we overcome the learning process then we need to realise that it’s our fault and deal with the consequences. Find ways to retain top talent instead of driving them away to better organisations that value their deliveries better. Hires are made based on online profiles including the activity of potential talent which affects the decision of on-boarding. b) DM us to @SourcingAdda with your Whatsapp. Contact no., full name & location. And one of our representatives will get back to you. WhatsApp Group Chat – Will further Job cuts in IT be a harsh reality in future? We’ve heard a lot about layoffs in the IT sector and the impact of Artificial Intelligence taking over jobs that can be automated. Having said that it’s obvious for one to wonder if further job cuts in the IT sector are a harsh reality in future? IT industry hasn’t matured, instead there are additions but employees aren’t retired because the IT Industry started in the 90’s. Considering the average of 35 yrs. for service for retirement these people will retire in another 5-10 yrs. The Recruitment field will experience job cuts in the future due to the ATS maintenance being automated. Knowledge is the key hence constant learning is the need of the hour which should continue to 60 yrs. and beyond. Learn about python, shell script and Perl scripts to automate Manual Testing and Cofig jobs. The Key is to keep yourself abreast of the latest trends in your field of work. To minimize the lay – off wave you need to reduce the retirement age in the Indian industry to 55 yrs. If one can be very technical yet have team collaboration it minimises the chances of the person being laid-off. Governments should intervene and keep tabs on the number of hires and what’s their attrition and retention percentage since layoffs affect the whole family. The other Industries that can be affected are food, banking, real estate etc. IT industry is saturated and with many mid – level professionals waiting for Senior Level Assignments to crop up.